The bathroom can be your clean sanctuary. Just start with these essential bathroom organization tips and creative storage ideas that work even for a tiny bathroom. 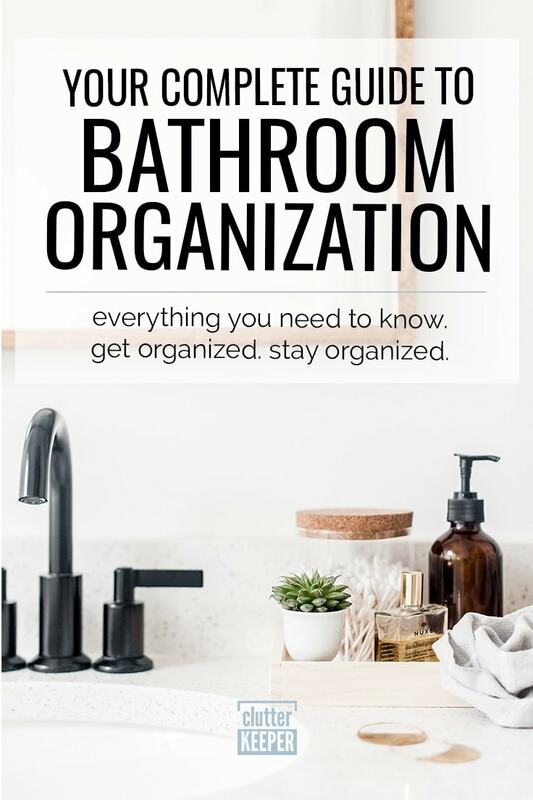 Let’s work together to organize your bathroom. It’s simple because it’s a small room with a very clear use. With these bathroom organization tips, you’ll soon have a clean and inviting bathroom your friends will envy. These ideas will kick start your organizing engine. When you start to organize your bathroom, the first thing you need to decide is how much stuff you are willing to let go and how much room you have to store what you keep. Once you are focused on your goals, you are ready to start creating an amazing bathroom. There are 3 main decisions to make as you organize your bathroom: what is essential, where to store small items, and how much more storage space you need. If you are short on storage space, then decide which are the most important things to keep, like your toothbrush, toothpaste, toilet paper and towels. If your child likes playing with toys in the tub, how much can you keep without stepping on them all over the floor? This is a tough decision to make, especially if you are short on space. But making these hard decisions are so important. If you keep too much stuff, it can make you feel overwhelmed very easily, which will then snowball to even more disorganization. Remember: medicine expires. So throw out the ones that are not good anymore. Also, don’t keep toys or beauty products that are broken or falling apart. Another fantastic tip: If you don’t have room to store it, then get rid of it. After you decide what you need in the bathroom, you are ready to organize your stuff so the room stays clean. Bathrooms are notorious for looking dirty, but don’t let loose bobby pins, cotton swabs or cotton balls be the beginning of a large problem. There are lots of fun and creative bathroom storage hacks for these small toiletries. If you have drawers, organize them with separators and small baskets. You can also recycle plastic bubble gum containers as a way to store hair ties and pins. If you use them as containers, label them so you can find what you need in seconds. If you need more storage space, invest in some products that will keep your bathroom organized. Buy shelves or more drawer space if you need it. Adding storage to a bathroom is always worth the money you put in. Having a place for everything you own can increase your feelings of peace and decrease anxiety. There are lots of DIY hacks online, so your financial investment can be pretty minimal. Look for baskets and shelves at second-hand stores and reuse items from your recycle bin – like mason jars – for some creative bathroom organization ideas. When you decorate with items that also organize your stuff, you create a beautiful space that will make you smile! Decide on a theme and let that guide the rest of your decorating and organizing decisions. Do most of your decorating in your main color and then use your jars, baskets and other organizers to pull out the complementary colors in the theme. You can use ribbon as accents in baskets, spray paint wire shelves, or even use paint pens to label jars in the colors of your choice. One of the most underutilized spaces in the bathroom are the walls. These are prime spaces for storing the essential items you use daily. Make your bathroom spicy! Store your nail polish, beauty products, or even toothpaste and other things you use daily in a spice rack. Our Life In A Click has a super easy tutorial. Mason jars are such a beautiful way to enhance your decor and they double as amazing little storage containers too. The DIY Playbook has a tutorial that involves hanging up a row of mason jars on some wood and it looks so homey and cottage chic. There are so many ideas online for how to store towels in the bathroom. If you have a few matching baskets, you can hang them on the wall and store your towels and washcloths in them. The structured sides of the baskets not only looks beautiful and put together, but it keeps the towels from appearing disheveled too. Large bathroom closets or cabinets are a blessing in disguise. They offer a ton of space, but can easily become a place you just shove a bunch of stuff and shut the door. So before you go any further, attack your closet or cabinet. Place like things in baskets and bags. When you are looking for baskets or storage organizer bags, make sure you buy ones that can be labeled easily. It’s best to label everything you store so you can find what you need. For more tips, check out our Complete Guide to Medicine Cabinet Organization. Clutter Keeper Deluxe Storage Bags have a clear plastic front so you can see exactly what is inside. There is also a small pocket in front where you can place the label. These are perfect for storing towels and other linens. You could also put small containers inside one large bag, storing things like extra toiletries for guests. Hair dryers and other smaller appliances can be stored in a file box attached to the side of your bathroom vanity. All it takes is a file box and some Command hooks. Dream Green DIY has the tutorial, it’s pure genius. Keep your shower free from loose products (and easier to clean) by hanging them up on a shower rod. Just get some clips and a few extra shower rings. Then clip bottles of body wash, face wash, even loofas, to the shower rings. You can attach them to your current shower rod or install a second shower rod to hold them. Whoever invented lazy susans should win a lifetime achievement award. 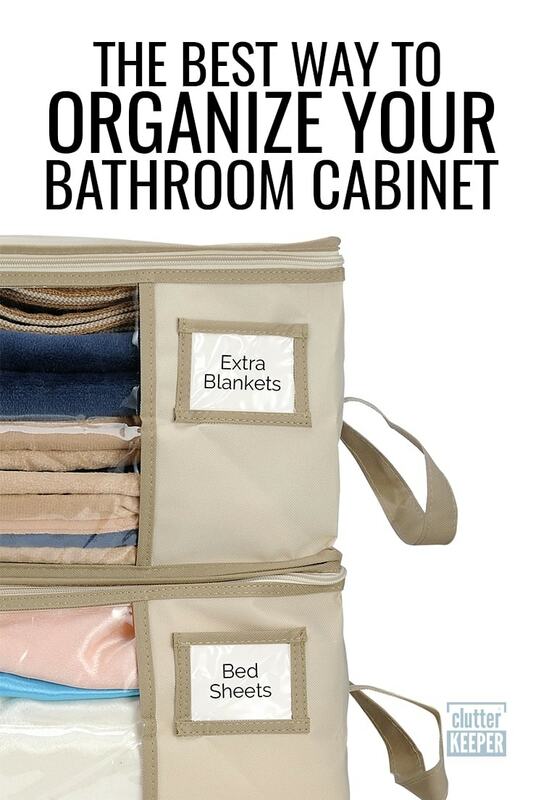 They are incredibly useful for organizing things in the kitchen and bathroom. If you have a cabinet under your bathroom sink, it’s probably dark and difficult to use. Maillard Ville Manor used a lazy susan and that entire space is a storage dream. Instead of pulling 5 things out to reach the stuff in the back, just turn the lazy susan around. So easy, and such a life saver. With these hacks, you are ready to organize your bathroom. Make it beautiful and make it useful. You’ll love your bathroom after you do. Sometimes having a small bathroom means there isn’t enough places to store all your stuff. But it is possible to organize a small bathroom without spending a fortune. Keeping a bathroom organized can be hard, but keeping a small bathroom organized can be even harder. With a small bathroom, you may find yourself struggling with the space constraints even more than you would normally. This is very common, and many people resort to buying expensive products or doing costly renovations. Let’s be honest, we don’t all have that sort of money. We want to help you get organized and stay organized, so here’s how to organize a small bathroom on a budget. If you’re on a budget, you need to take time and really think about each dollar you’re spending, and where it’s going. Go through your bathroom and identify a few problem areas to focus on. Doing this will make a world of difference when it finally comes time to actually spend your hard earned cash. Sure, you’ve been eyeing that new soap dish or towel rack for ages, but do you really need it? It would be crazy to spend money on a soap dish when your bathroom cabinet is so disorganized it spills out every time you open it. This may seem like oddly specific advice, but it made the list for good reason. Boxes and bins are extremely versatile when it comes to organization, and can be found for cheap. When you have a limited budget, getting 4 bins instead of a single set of drawers can make all the difference in your end result. Focus on boxes or bins based on the sizes of the items you need to store and keep in mind the space you have available. You don’t want to come home with bins that won’t fit where you need them in your small bathroom! A small bathroom can most likely be organized on a $10 budget if you shop frugally. Keep in mind, this will limit your style choices in favor of saving money, but on a tight budget, every dollar counts. Shopping at your local dollar stores can get you some cheap plastic bins for keeping everything tidy at very cheap prices. However, at thrift stores, you could find entire sets of drawers, shelves, really any container you can imagine if you’re lucky. Thrift stores can be a treasure trove of organization tools if you’re creative in their usage! This one may seem obvious, but it is frequently overlooked. Make sure you use the things you already have before buying new ones, especially if you’re on a budget! You should go through and remove any items from your bathroom that are no longer in use, as this will free up some space for what you need. Combine that with using any available storage containers you might have and you may already be well on your way. Nobody likes having a messy disorganized bathroom, but take all that mess and put it in a small bathroom and you’ve got a recipe for disaster. Now that you know how to save money as your organize your bathroom, let’s look more specifically at one of the messiest spots – under the bathroom sink. The cabinet under your bathroom sink can turn into a place to put things that don’t have a home, slowly making it an overfilled, unmanageable mess. This can be extremely frustrating when you’ve just cleaned your bathroom and everything is sparkling, only to open the cabinet and have disorganized junk pour out. Fortunately, we’re here to help you get organized and stay organized with these tips to organize under your bathroom sink! The first step in any organization task is cleaning out your area. Take everything out from under your sink and lay things out in a way that’s easy for you to see each item. Take this time to really get in there and clean under the sink. Odds are if it wasn’t organized before it has probably seen better days. Once it’s all clean and ready to go, you can start to work through what needs to go back in. Next, go through each item one by one and first decide if it’s something you truly need and will use. It can be hard sometimes to be honest with ourselves in this phase, but stick with your gut and follow through. Grab a trash bag for used items, and consider donating unopened items. With the trash sorted out, start making categories. Using these categories, or ones you’ve come up with to fit your needs, start putting items into piles. The size and number of these piles will help you determine how you’ll organize it all! Now that you know your categories and how big they are, start looking at storage solutions. If you don’t have a way to keep each category contained, they will start mixing with each other over time. This will put you right back at square one, and we don’t want that! Smaller items like q-tips, spare toothpaste, floss, or tweezers are easy to lose and are best suited to small drawers. Medium size items like deodorant, hair spray, perfumes, or colognes can be kept on a shelf under the sink. Larger items such as spare shampoo, conditioner, tile cleaner, or toilet bowl cleaner are best kept in boxes. The most important part of getting organized is making sure everything has its place. The most important part of staying organized is actually putting things where they go! Make sure your organization system is easy to use, or you may find yourself going back to old ways. When arranging your new storage solutions, be mindful of what items are in each container. Things that you use frequently should be accessible with minimal effort. If you always need to reach your tweezers, don’t put them in a drawer behind bulky items like cleaners. The more you have to fight your organization system the less likely it is you’ll stick to it, so make it easy on yourself! Keep your most used items toward the front and you’ll find it much easier to maintain. It can be easy to ignore the area under your bathroom sink with an “out of sight out of mind” attitude, but this will only cause trouble when you need to use something trapped in the mess. We know the struggle, and that’s why we want to help you get organized and stay organized. By following these tips we guarantee you’ll feel better about your bathroom, and will have a much easier time using your storage space effectively. There you have it! With these tips, you will be able to create a tidy and organized bathroom, no matter how small the room or your budget is. If you are ready to tackle some other rooms around your house, here are more tips and ideas that will inspire and equip you. Kitchen Organization Guide – This is a thorough guide that will help you organize your kitchen. Craft Room Organization – These are tips for busy crafters who don’t have much time to spare. Living Room Organization – A complete guide to living room organization.